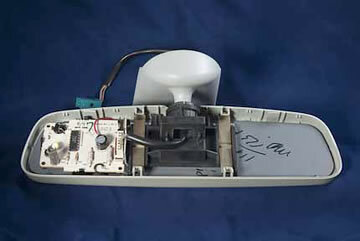 This is a typical electronically dimming rear view mirror with the back cover removed. The electronics, mirror and swivel assembly all rely on the two metal clips adjacent to the swivel ball in the center to hold the assembly in place. The two clips are fasted to the outer shell with plastic tabs. Should the mirror housing be stressed in some fashion these plastic tabs will usually fail necessitating the replacement of the entire mirror unit. A new mirror repair kit. 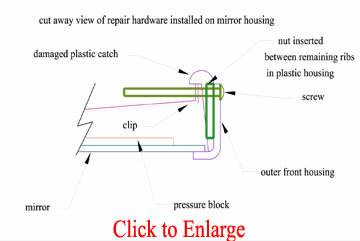 The mirror housing shown here in diagram can be repaired in a cosmetically appealing manner without the mess of attempting to re-glue and realign damaged plastic parts. Our kit uses a specially designed black anodized screw and nut that takes advantage of the ribs that are present near the locking tabs. 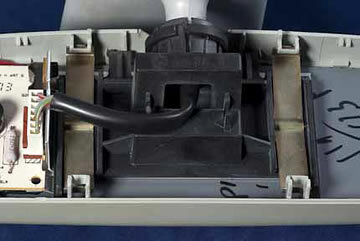 The custom nut is trapped between the ribs and a screw is feed through a hole in the front housing shell. 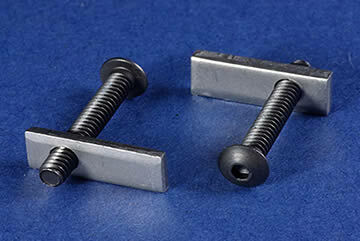 The protruding screw passed through the metal clip ( drilling is necessary ) and captures the metal clip restoring the clamping action of the clip thereby holding the entire assembly as it was originally intended. The repair is externally aesthetically pleasing, quick and offsets the expense of the entire mirror assembly at a small fraction of the cost.